Who says print is dead? 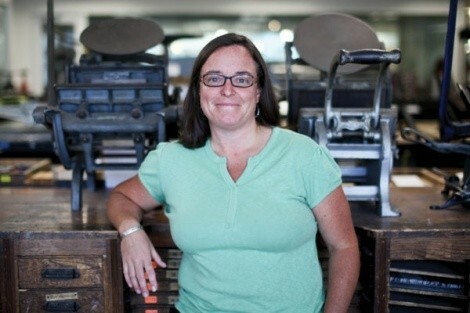 Marnie Powers-Torrey, managing director of the Book Arts Program at the University of Utah, recently completed piles of paperwork in the long process of getting approval for a Certificate in Book Arts, the only one of its kind in the Intermountain West. The certificate allows undergraduates, graduate students and even returning post-graduates to receive a designation in Book Arts. In December, the Board of Regents will also consider a proposal for a minor in Book Arts. What could someone do with a Book Arts Certificate? We’re not a technical school; we’re not providing you with something that you can go out and get a job with now—maybe 70 years ago. But I do think that it provides people in English and art in other areas with something other on their transcript that makes them stand out. These designations are very rare nationwide; there’s just five other undergraduate institutions that offer a designation in Book Arts. What was the process of making the certificate happen? There’s a series of approvals. I had the dean of the Marriott Library approve it first. Then it goes to the curriculum committee at the art and art history department, then it went to the fine arts committee and the college of fine arts, then it had two more levels of approvals. It wasn’t too rigorous, but there was a real need to describe what it was that we were asking for, and making sure that it fit in with what the university is doing. The last process was the president’s office, and then it went to the Board of Regents. They really felt that it was all positives and there weren’t drawbacks associated with the proposals. How do you explain the popularity of the program? I thought the printed word was dead. It’s so engaging for so many different types of people. Book Arts is very accommodating. It offers a bridge between disciplines. There are certain places—the gym, the airplane—where you don’t want to carry Ulysses. But people want to interact with a physical book when it’s convenient to do so. It’s a more enjoyable experience, and it celebrates humanity in a way that interacting with an electronic device won’t ever. I went to a conference recently where a guy said that the iPad was the Darth Vader of letterpress printing, and I don’t think that’s necessarily the truth. As the digital and the electronic age progresses, people become more interested in spending some of their time away from the screen. And, certainly, the digital enhances what we do here. You can produce some pretty interesting stuff on the computer and then print it with tactile ink. I don’t feel that we’re at odds; I don’t feel like the book’s an endangered species. 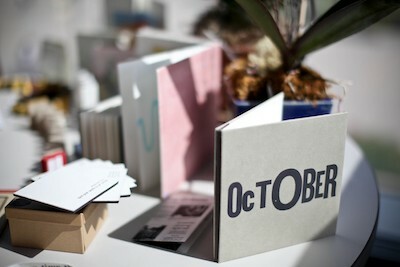 I think the old media is kind of the new media, as far as artists’ books go. The program asks “the academic question of what constitutes a book and how art plays a role in that discussion.” What’s the answer? The book is so familiar to humans throughout history; it’s this familiar and welcoming form. People from across disciplines and areas of expertise are invited to participate. Not to say that it’s less rigorous than other art, but there is a kind of familiarity that allows people to locate the narrative within themselves and enables them to tell their own story, whether it’s visually, through text or exploring the book object itself, and how it’s sort of deformed, changed and metamorphosed in today’s world. 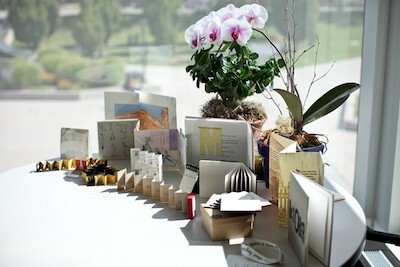 When and why did the Book Arts program come into being? The program actually started in 1995, but we began teaching full-semester academic courses in 1999. Previous to 1999, we had so many students asking if courses would become available that we approached the art department—which we still teach through today—and they said, “OK, let’s see if this goes,” and it really went. Since ’99, we’ve had an amazing number of students from across campus who have been interested in using their hands. How would the minor differ from the certificate? The minor gives you some options if you want to take some other courses beyond. With the minor, say you’ve taken some Book Arts courses and you want to round them out with some classes in other disciplines, you can. But the certificate, it’s for Book Arts classes, plus two electives, from a list, which are primarily art history and creative writing. But, foreseeably, a student could argue that they want to take this biology class because they’re interested in the cellular makeup of blah blah blah, and they could produce a book about it. What does the graduate degree in Creative Writing, Book Arts and New Media entail? It’s really pushing the envelope of how text operates when it’s not on a physical page anymore—playing with hypertext and the various ways of linking thoughts. There’s a student who’s working in the MFA program right now and thinking about taking a Wikipedia article and re-creating it on the letterpress, this documentation of a virtual experience. The degree was spearheaded by Paisley Rekdal in the English department, who was the head of the creative writing department for the past three years. She approached me and said, “I really want to do this, how do we make it happen?” When she brought it to me, it was during a time of economic reckoning, and it was a tough time to do it—what interdisciplinary studies mean is that departments have to give up some of their financial stability to make things work, and come to an agreement. But it happened really readily; the English department wrote outstanding letters of support. The new-media portion functions primarily through the technology department in art, and there are also some communication classes you can take. The emphasis is on the creative writing and the book arts, talking conceptual development and the technology side providing the tools to apply the concept. What are the Book Arts courses? Letterpress 1 is really technically based on how to get on those presses and use them, and how to use all of the equipment in the studio well and how to care for it. It’s also an attempt to get people to think about typographical decisions as well as let everyone realize that they have power over words, that they can write something, that they can make a mark. Letterpress 2 and 3 are more student-directed; you decide what project you want to accomplish and we help you accomplish it. You learn more about the presses and how to take care of them. People sometimes go away from these classes buying their own press and starting their own small businesses. Bookbinding 1 is very technically based, to learn the craft of putting a book together well, and it’s very meticulous. Once you gain that knowledge, there are so many things you can do. But the focus is that, if you don’t put it together well, no one wants to look at it. Bookbinding 2 and 3 are more student-directed. It’s primarily blank books, though if you were taking Letterpress and Bookbinding at the same time, you could be printing and binding both. Artists’ Books is really more concept-based, and we read some critical theory. It’s very fast-paced, and it’s more about the process, not the end project. There might be a second Artists’ Books course sometime in the future.